What Braintree Triggers and Actions are Supported? New Customer - Triggers when you add a new customer. New Transaction - Triggers when you add a new transaction. 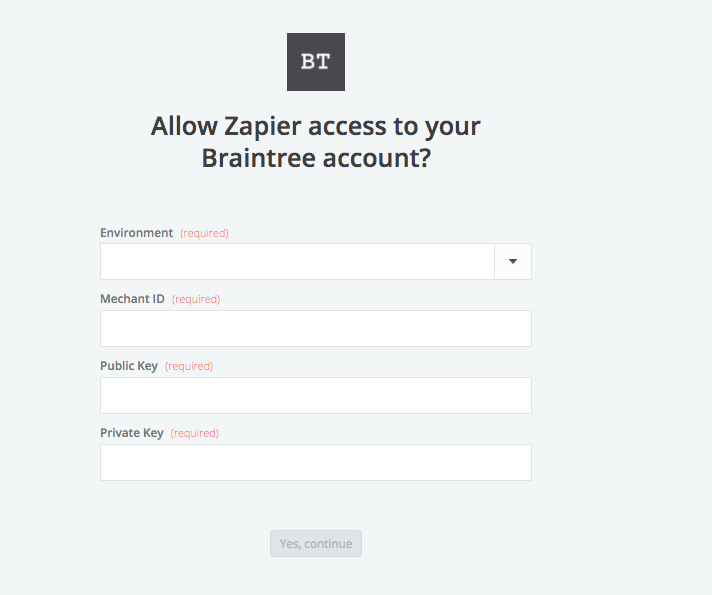 To get started with Braintree on Zapier, first you will need to click to connect your Braintree account to use with your Zap. Next, you'll be asked to enter your Braintree API keys, Merchant ID and Environment. Login to your Braintree account here. note: login to sandbox if you are testing and production if you want to work with real transactions. Click "Account" > "My User" from the top menu. On the page that loads, under "API Keys, Tokenization Keys, Encryption Keys" click "View Authorizations". Then click "View" on that new API key that appears. On this page you will find all the information you need to copy and paste into Zapier. Paste your key back into your Zapier account and then “Continue”. 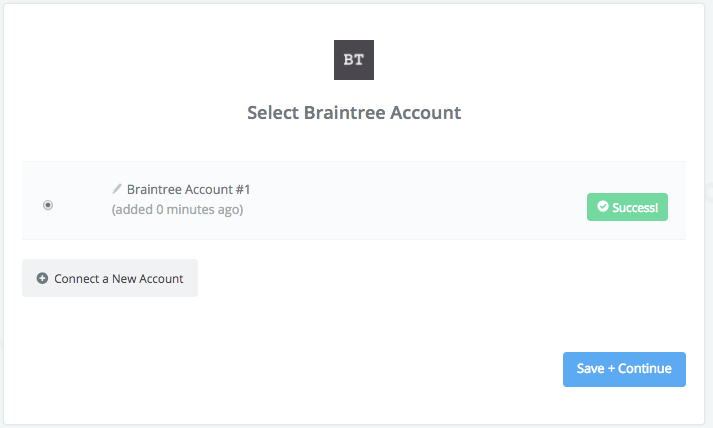 If your API key was entered correctly your Braintree account will now be successfully connected. In order to reduce the amount of data we pull when polling Braintree we only look at Customers and Transactions from the past 6 hours. When the zap is running this is no big deal but can be a little confusing during the initial setup. So we recommend adding a single transaction or customer through the sandbox for testing, then switching over to live. Alternatively, you can test against your live account if you have had transactions or new customers added within the last 6 hours.